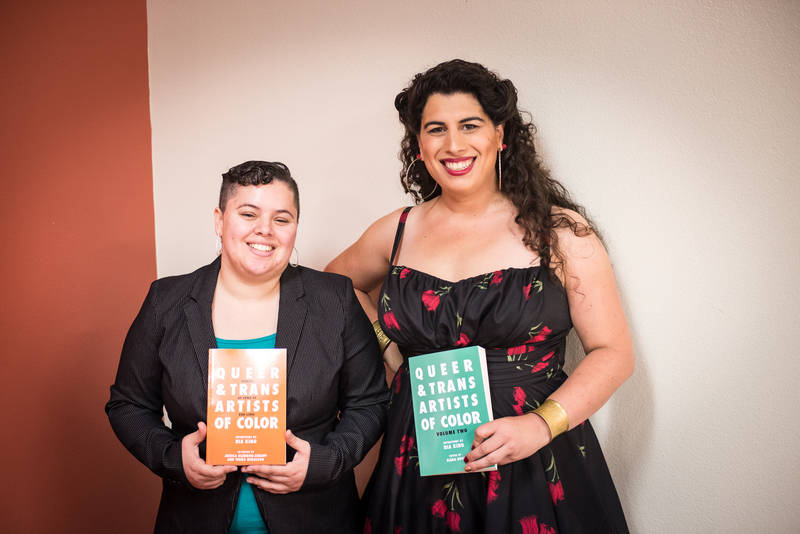 Queer and Trans Artists of Color, volumes 1 & 2! Building on the groundbreaking first volume, Queer and Trans Artists of Color: Stories of Some of Our Lives, NIA KING is back with a second archive of interviews from her podcast We Want the Airwaves. She maintains her signature frankness as an interviewer while seeking advice on surviving capitalism from creative folks who often find their labor devalued. In this collection of interviews, Nia discusses biphobia in gay men’s communities with JUBA KALAMKA, helping border-crossers find water in the desert with MICHA CÁRDENAS, trying to preserve Indigenous languages through painting with GRACE ROSARIO PERKINS, revolutionary monster stories with ELENA ROSE, using textiles to protest police violence with INDIRA ALLEGRA, trying to respectfully reclaim one’s own culture with AMIR RABIYAH, taking on punk racism with MIMI THI NGUYEN, the imminent trans women of color world takeover with LEXI ADSIT, queer life in WWII Japanese American incarceration camps with TINA TAKEMOTO, hip-hop and Black Nationalism with AJUAN MANCE, making music in exile with MARTÍN SORRONDEGUY, issue-based versus identity-based organizing with TRISH SALAH, ten years of curating and touring with the QTPOC arts organization Mangos With Chili with CHERRY GALETTE, raising awareness about gentrification through games with MATTIE BRICE, self-publishing versus working with a small press with VIVEK SHREYA, and the colonial nature of journalism school with KILEY MAY. Bear witness to QTPOC brilliance. “This book shines a spotlight on QTPOC artists, activists and self-proclaimed weirdos, a group who rarely receive such attention. Top and bottom photos by Sunshine Velasco. Middle photo by Pendarvis Harshaw.